Sometimes itty bitty baby burgers are just what you need to satisfy your burger craving. These cute little grilled sliders are perfect for sharing! During the summer months, I regularly get cravings for a juicy burger cooked on the grill. Typically I make a traditional sized burger that fits nicely on a standard bun, but sometimes itty bitty baby burgers are just what I need to satisfy my burger craving… even if finding itty bitty buns for the sliders turns out to be a wild goose chase! In those instances when a burger craving hits, I turn to these yummy grilled sliders with fresh sharp cheddar cheese, crisp bacon, and a “special sauce ” (no, I’m not talking about McDonald’s ‘special sauce.’). The special sauce is really quite simple – 2 tablespoons of mayo get combined with 1 tablespoon of coarse ground dijon mustard. 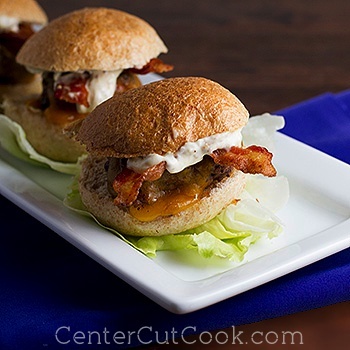 Easy, but flavorful, and adds a whole new depth of flavor to these sliders. A slider isn’t complete without the mini sized bun, which *most* grocery stores sell, so I hear. Unfortunately I felt like I was on a wild goose chase trying to find appropriate sized buns and I ended up settling for round dinner rolls that actually worked quite well. So if you’re having difficulty tracking down slider buns, perhaps try using dinner rolls as well. Notes: I wanted a strong cheddar taste with these burgers, so I used a hunk of Tilamook Sharp Cheddar Cheese and cut 1/4 inch thick square of cheese for each slider instead of using thin slices of cheddar from the deli. Additionally, when seasoning the burgers, I typically just use salt, black pepper, and garlic powder. This week I had been to a spice store near my house and picked up a blend called BBQ 3000 which I used this time around and I loved the flavor that it gave. Season the burgers however you’d like! Lastly, I had cooked extra bacon for breakfast that we used for the sliders. If you don’t have bacon already cooked, you’ll need to fry some up while the burgers are cooking. Alternatively, you can cook the bacon in the oven. Line a rimmed pan with foil, then arrange the bacon in a single layer. Place the pan in a COLD oven. Turn the oven on to 400 degrees and cook for about 18-22 minutes, or until crisp. Heat a grill pan to high heat, or heat a grill to medium-high heat. Divide one pound of ground chuck into 6-8 even sections, depending on how big you want your sliders. I thought 8 was just right. Form each section of meat into a round slider. Season each slider with salt, pepper, and garlic powder, or use your own blend of seasonings. Place the burgers on your pre-heated grill or grill pan and cook for about 4 minutes per side for medium, or until the burgers are cooked to your preferred doneness. Remove the burgers from the grill. Top each with a slice of cheddar cheese, then cover the burgers so the cheese can melt. In a small bowl combine 2 tablespoons of mayo with 1 tablespoon coarse ground dijon. You may need to double the recipe if you like things saucy. Spread some of the mayo/mustard mixture on each bun, then add your slider, and top with a half strip of bacon.